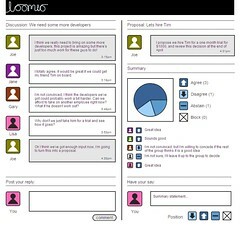 Loomio : Loomio is a free open-source web application that helps groups communicate more effectively and make better decisions together. Enspiral is a collective of social benefit companies structured as a network of talented developers, designers, strategist, communicators and other professional services providers sharing resources and doing work together to help create a more equitable, harmonious and sustainable world and workplace. 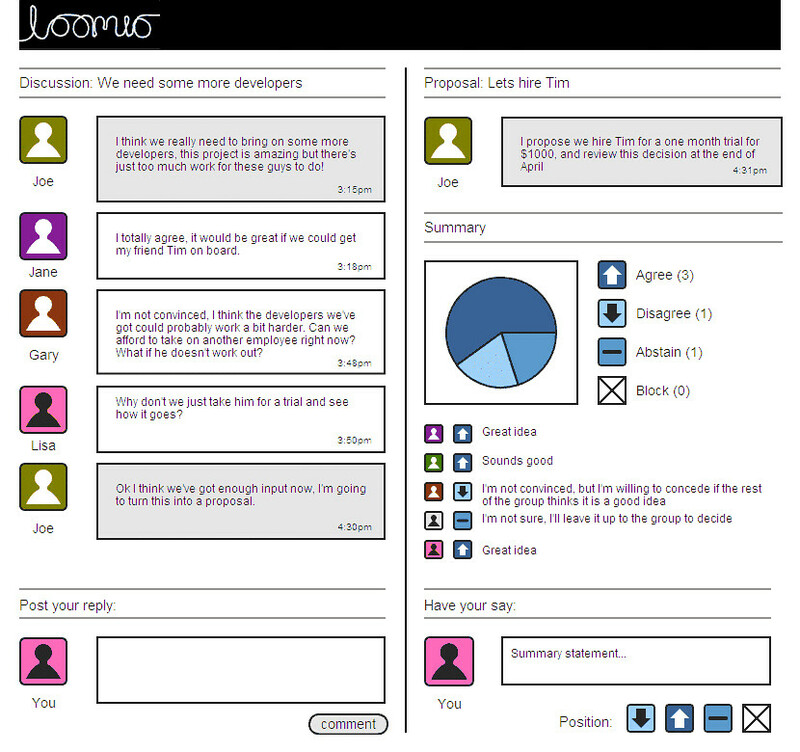 Loomio is a free open-source web application that helps groups make better decisions together. It's designed to suit any kind of group, from businesses to community groups to government. A team of more than a dozen of us have been donating our time to this project for the last 3 months because we strongly believe that the idea has tremendous significance, with the potential to make all organisations more democratic and participatory. We are operating on a not-for-profit and open-source basis. We’re motivated by a desire to spur positive social change in our local, national, and global community. A group member suggests a specific proposal. The members of the group discuss the pros and cons of the proposal, going into as much detail as necessary. Each member of the group gives a short statement summing up their view, and clicks a button to indicate their position (yes, no, abstain, block - or other definitions defined by the group). As the discussion progresses, the proposal is modified to try to turn all the No’s into Yes’s. Participation: this process is really simple and straightforward, so it is easy to get everyone in the group to engage with the discussion. By engaging everyone, the true potential of the group can be reached. Focus: having the proposal at the top of the screen keeps the group discussions focussed and on topic. Brevity: the concise summary statements are a quick way to get an accurate overview of any problems that individual members may have with the given proposal, so those problems can be rapidly addressed. Doing everything online means you don’t have to spend all day in interminable meetings, and you can work across distances and time zones and enable busy people to be involved, too. In addition to this basic process, we have a lot of features in mind to improve Loomio even more. These will allow Loomio to scale up both in terms of the scope of discussions it can facilitate, and the number of participants that can be productively engaged, while still maintaining coherence and efficiency. We want to use software to express the magic that happens when everyone puts their heads together and comes up with an idea better than any one person could have done on their own. We also have lots of ideas for ways of visualising groups’ data to help them better understand themselves, and make even better decisions. And if you’ve ever been involved with a group decision-making process you’ve probably got some ideas for how to make things work more smoothly too - we want to hear from you! Loomio is already being used by several groups, including Enspiral (a social enterprise incubator), the Open Source Community Gallery, and BuckyBox (a social enterprise building software for organic food distribution networks). Development of the tool is guided by the needs of the users, with a focus on simplicity every step of the way. Our goal is to develop Loomio to the point where we can bring on even more groups of users and incorporate their feedback, too. Loomio is currently being developed by a passionate team of volunteers in their spare time. The Loomio team includes community workers, business people, artists, programmers, activists and academics. This diversity means we're making a tool that's useful to all kinds of different groups. In fact, we originally came together because we realized our very different organizations actually had similar needs when it came to decision-making: we all wanted to maximize participation and fairness without sacrificing efficiency. Right now we're asking for a few thousand dollars to allow a couple of our core team members to focus on this project full-time for two months without starving. Our goal for this stage is to get the software ready for a public beta (meaning, ready for you to use!). For Loomio to live up to its potential, it needs the input of lots of enthusiastic people. We’ll use any funding we receive to get the software to a point where we can handle all of this input effectively. If you want to stay up to date with the project, you can follow us on Twitter and Facebook,or read our blog. Feel free to email us at [email protected] for more information. Very exciting news! Yesterday the Loomio PledgeMe campaign reached the initial funding target of $5000! We can't thank our generous supporters enough for throwing their inspiring energy and hard-won cash behind this project. The overwhelming support shown by such a diverse range of people/organisations has really driven home that this is an idea lots of people have been waiting for - the importance of removing the barriers to open, participatory, democratic decision-making is an increasingly obvious need, and we're delighted that so many great people are prepared to help us get there. Getting to the pilot funding target is going to allow our core programmers to devote all their waking hours to getting Loomio to the point where we can really open it up, for free, to the many community groups and non-profit organisations waiting to get on board. This is extremely exciting, but also a bit daunting - we're just starting to realise how much time and energy it's going to take to support all these new users when they jump in and start using Loomio in their organisations. It's such a trade-off between going all out and helping as many organisations as we can, and making sure we have the resource base to offer rock solid support to all of them, while implementing their suggestions for making Loomio better. This means that it's absolutely not too late to help Loomio reach it's true potential - every donated dollar above our initial funding target will allow us to put that much more time and effort into taking on new users and helping as many organisations as we can. Any help at all in spreading the link to our PledgeMe campaign as far and wide in the next two days before the final cut-off in two days (8.30pm Friday) would be immensely helpful! Thank you again for your amazing support. We couldn't do this without you. We can’t thank you enough for your amazing support! It’s been inspiring to see so many people from all walks of life putting their hard-earned money behind our idea - from businesspeople to broke artists, from community workers, to academics, to civil servants and politicians. There have been lots of exciting developments since the PledgeMe campaign began. The Loomio team has doubled in size - as of today there are six passionate developers churning out code, with a solid outreach team making connections with a huge range of diverse groups, including community organisations, NGOs, local businesses, government departments, city councils, and lots more. We’ve also doubled the number of people using Loomio, and are getting some amazing feedback. Right now, it’s being used to collaboratively write employment contracts for a social enterprise incubator, approve exhibition proposals at a community art space, develop a pest management strategy for a biodiversity reserve, and, importantly, to make decisions about the development of Loomio itself. We’ll have a major Loomio release ready by the end of the week, and we’re gearing up to take on a new batch of users in about three weeks. Can you help spread the word about the PledgeMe campaign? It closes in a couple of days, and we need to meet the $5k target or we get no funding at all. Collectively, our team has donated thousands of hours of work over the past 3 1/2 months, and we really need some resources to make sure we can hold on to these wonderful people. Thank you again for your amazing support - we couldn’t do it without you! This campaign was successful and got its funding on 18/05/2012 at 8:24 PM. Your contribution will provide our programmers with a stock-pile of instant noodles so that they can continue to survive. Also, we'll keep you up-to-date with developments and let you know when the app is ready for you to use. You and a friend will be invited to our launch party in Wellington where you'll mingle with all kinds of fascinating people and help us celebrate the initial release of the app. You and your group will be given early access to the tool, and your feedback will play an important role in guiding the future of the software. You’ll also be invited to the launch party. Our team members will facilitate a workshop for your organisation. We’ll set you up with Loomio, and provide guidance for using participatory decision making in your group. (In person if near Wellington, or via Skype otherwise). Also includes ongoing support via email, and you’ll be invited to the launch party.